Save the Green Planet (2003) star BAEK Yoon-sik is teaming up with fellow Korean film industry veteran SUNG Dong-il for Aridong, a new investigative thriller from director KIM Hong-sun of The Con Artists (2014). The film is based on a popular webtoon called Aridong’s Last Cowboy which already aired as a drama special on KBS in 2010. The actors will play a property owner and former detective who team up to look into some deaths in the Aridong neighborhood that seem to call back to a series of grisly murders that took place 30 years ago. BAEK most recently appeared in the hits Inside Men and The Last Princess while the ever prolific SUNG has several films lined up to go, including Because I Love You next month and both Real and RV: Resurrected Victims in the near future. 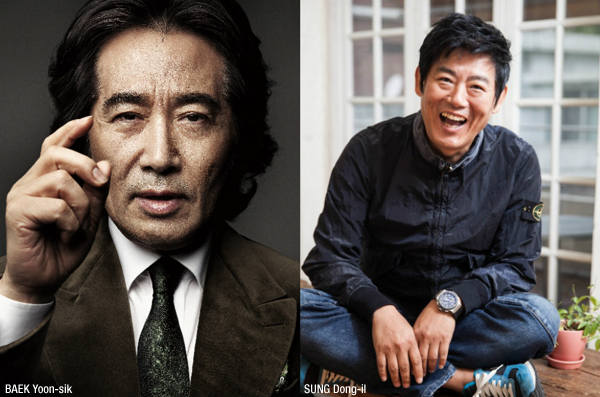 The actors will be joined by fellow performers CHUN Ho-jin (The Chosen: Forbidden Cave, 2015), BAE Jong-ok (Herb, 2007), CHO Dal-whan (The Magician, 2015) and SON Jong-hak (A Violent Prosecutor). Prior to the hit The Con Artists, director KIM also helmed the dark thriller Traffickers in 2012. AD406, the production company run by actor CHA Tae-hyun’s brother CHA Ji-hyun and which is responsible for hits such as The Grand Heist (2012) and A Hard Day (2014), will take care of the production while financing and distribution are being handled by Next Entertainment World (N.E.W.). Filming begins at the end of the month with a release to follow in 2017.